By Brian McCombie n this age of digital marketing and social media, many people are convinced that just one viral video, photograph, or article can propel them or their company to fame and fortune. Such thinking has certainly pushed its way into the shooting sports industry. 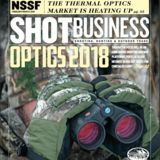 Although there’s nothing wrong with going viral, Doug Carbol and Randall Darby also know of another method for success in the shooting sports: good, old-fashioned face-to-face networking while putting your product lines on display. The Slim2.2 and Slim3.3 clips are narrower than previous iterations in order to accommodate smaller handgun holsters and knives. er show in the fall of 2015. 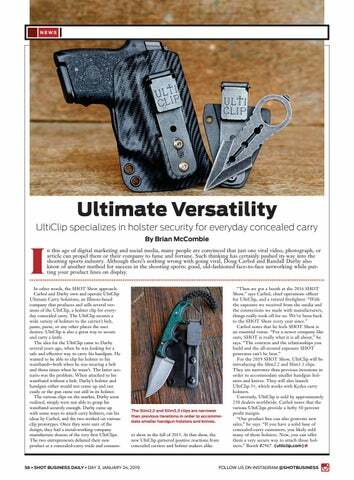 At that show, the new UltiClip garnered positive reactions from concealed carriers and holster makers alike. SHOT Daily from day 3 of the 2019 SHOT Show.